Sept. 24, 2006 WASHINGTON — Three former college football teammates of Sen. George Allen say that the Virginia Republican repeatedly used an inflammatory racial epithet and demonstrated racist attitudes toward blacks during the early 1970s. End of the New American Century? In America at present, a completely un-American debate is germinating: Is it time for neo-conservatism’s obituary? If political theories have an address, the address of neo-conservatism reads 1150 17th Street NW, Washington, DC. There on the fifth floor in rather ordinary-looking offices reside a half dozen right-wing intellectuals, who supply a steady stream of arguments for the propagation of democracy and a world dominated by America. The little club is called The Project for the New American Century . 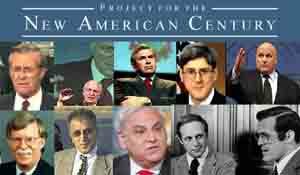 In 1997 nearly every important American neoconservative signed the club’s founding charter. The thinking that evolved here then circulated amongst a group of friendly think tanks. With the election of George Bush to the presidency and especially after 9/11, the significance of the think tank increased, even if the staff size remained small. Neo-conservatism was a dominant force in American foreign policy, and the network of friends had become a network of power. Now, nine years later, the Project for the New American Century is closing – due to a shortage of funds, it is said. Those that remain there are looking for work. Their ranks are thinning. The New American Century has taken too long to arrive. An ideology is packed up and in moving crates. One couldn’t have a sight more pregnant with symbolism. One needn’t look long for the crisis of neo-conservatism. The magic word is Iraq. The central project of this foreign policy school, the democratic transformation of Mesopotamia [Iraq], has not gone as hoped. Theory didn’t withstand contact with reality, and that reality has now swept away some theoreticians. And at the same time, a harvest of new treatises is emerging. The thinking of neo-conservatism, especially after 9/11, is based on an astute criticism of what had been the established foreign policy in America and Europe. The neo-cons rejected the usual left-liberal theory about the causes of the attacks, according to which the attackers were motivated by unfairness and a lack of modernization in the Middle East. Instead, the reason for the terror is a lack of democracy. But the terrorists recognized the hypocrisy of the West, which wants the Middle East’s oil, and despite its pro-democracy rhetoric entered into an evil pact with the authoritarian rulers of the region. The terrorist attacked the hypocrite. WALLACE: In a recent issue of the New Yorker you say you’re sixty years old and you’re worried about how many lives you can save…Is that what drives you in your effort to help? CLINTON: Yes. That sounds sort of morbid. The tone in which I said was almost whimsical and humorous. This is what I love to do it’s what I think I should do. I’ve had a wonderful. I got to be president. I’ve lived the life of my dreams. I dodged a bullet with that health thing. I think I owe it to my fellow countrymen and people around the world to help save lives and help people see the future. But as it happens I love it. I feel it’s a great gift. I feel it’s a rewarding way to spend my life. WALLACE: Someone asked you …he asked you if you could do more good as a former president than as a president and you said only if I live a long time. WALLACE: how do you compare the powers of being in office and what you can do out of office? CLINTON: When you’re president you can operate on broader scope. You can simultaneously work to stop the genocide in Kosovo, bring peace to the middle east, pass a budget that gives millions of kids a chance to have after school programs… So in other words you’ve got a lot of different moving parts and you can move them all at once. But you’re also more at the mercy of events. That is 43 did not run for President to deal with the events of 9/11 but once it happened it wasn’t as if he had an option. Once I looked at the economic data after I won the election, I realized I would have to work harder to reduce the deficit and therefore have less money in my first year to invest in things I wanted to invest in. WALLACE: So what is it that you can do as a former president. CLINTON: So what you can do as a former president, you don’t have as wide a range of powers so you have to concentrate on fewer things. But you are less at the mercy of …events. If I say look we’re going to work on economic empowerment of poor people, on fighting aids and other diseases, on trying to bridge the religious and political differences between people and on trying to avoid the worst calamities of climate change and try to revitalize the economy in the process, I can actually do that. Because tomorrow when I get up and there’s a bad headline in the papers, it’s President Bush’s responsibility and not mine. That’s the joy of being a former potus. And it is true that if you live long enough and have discipline in the way you do it — like this CGI — you might be able to effect as many lives as you did when president.